Note: The correct name of one of the reindeer is "Donder", not "Donner" – an error introduced in the Robert L. May children’s book, "Rudolph, the Red-Nosed Reindeer" (1939). The original manuscript by Dr. Moore has been lost, however, he did produce other long-hand versions of his now famous poem. One of these hand-written, signed copies of the poem was sold for $255,500 at a Christie’s auction in 1994. Dr. Moore wrote a facsimile that reproduced on a separate page. 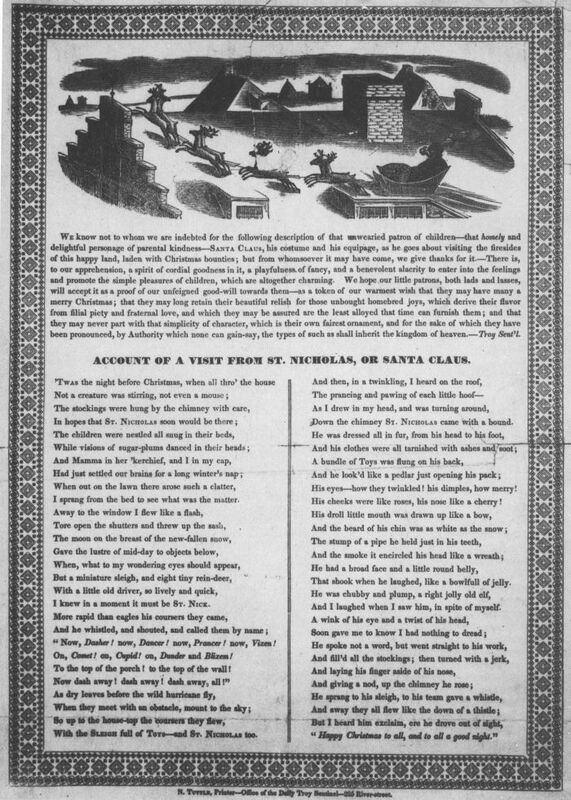 There were subsequently many different publications, each illustrated according to the characteristics dictated by the poem, published from 1823 onwards. One of the first illustrated copies was the reprint by the Troy Sentinel in 1830; the engraving by Myron B. King showed Santa with sleigh and eight reindeer on a roof. A copy is reproduced left. 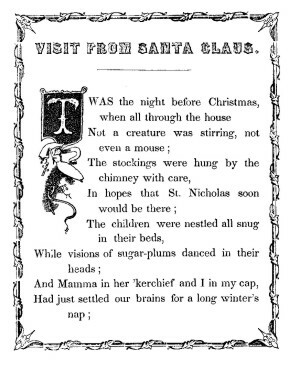 An early illustration in book form of "A Visit From St. Nicholas" was in 1848 by Henry M. Onderdonck, with six illustrations by Theodore C. Boyd, who pictured the diminutive Santa in a breach coat and short pants. This booklet was reprinted in 1971 by Dover Publications, New York, which was a reproduction of a volume printed in 1934, complete with a 30 page biography of Moore by Arthur N. Hosking. The 1934 reproduction was itself a facsimile of the original 1848 edition.